Downbound the Welland Canal, April 10, 2010. The second of three sister ships to be constructed for Misener Transportation Ltd., St. Catharines, ON; this Great Lakes and ocean gearless bulk carrier was built as hull #257 by Govan Shipbuilders Ltd., Govan, Scotland. The new vessel was christened as the Canada Marquis on April 15, 1983; clearing Scotland on July 11, 1983 on her maiden voyage to Canada. This bulker and her two sister ships were built to give Misener Transportation (as well as the Misener managed and crewed Pioneer Shipping Ltd.) the capability of operating year round. The goal was to operate these vessels on Great Lakes trades during the navigation season, the ocean trades during the winter months. The other two sister ships were the Selkirk Settler (also christened on April 15, 1983) sailing under the Misener banner and the Saskatchewan Pioneer sailing under the Pioneer Shipping banner. Of note; the Selkirk Settler now sails as the Spruceglen (2) for Canada Steamship Lines, Montreal, QC and the Saskatchewan Pioneer as the Voyageur Pioneer for Voyageur Marine Transport Ltd., Ridgeville, ON. The Canada Marquis was built with private air conditioned rooms. The vessel is powered by a single Sulzer model 4RLB76 two stroke cycle, single acting 4 cylinder 10,880 b.h.p. (8,098 kW) diesel engine burning intermediate grade fuel oil; the power being fed to a single controllable pitch propeller in a Kort nozzle giving the vessel a rated service speed of 13.8 m.p.h. She is equipped with a 1,240 h.p. (923 kW) KaMeWa bow thruster. Seven hatches equipped with McGregor hydraulic hatch covers with automated cleating service 7 holds where the vessel is capable of carrying 33,824 tons (34,367 mt) at her maximum draft of 32' 08" (9.962m) and 25,875 tons (26,291 mt) at the Seaway draft of 26' 06" (8.08m). Cubic hold capacities include 39,500 net tons of coal (standard measurement for coal, equivalent to 35,268 tons or 35,834 mt)*, 35,195 (35,760 mt)* of wheat, 33,203 tons (33,736 mt) of corn or rye, 29,125 tons (29,593 mt) of barley and 26,776 tons (27,206 mt) of oats. Other capacities include 1,363 tons (1,383.5 mt) of intermediate fuel oil and 124 tons (126 mt) of diesel oil. The vessel's hull was built to Lloyd's 100 A1, Ice Class 3 classifications and strengthened for heavy cargoes (with holds 2, 4, & 6 or 1, 4, & 7 remaining empty). 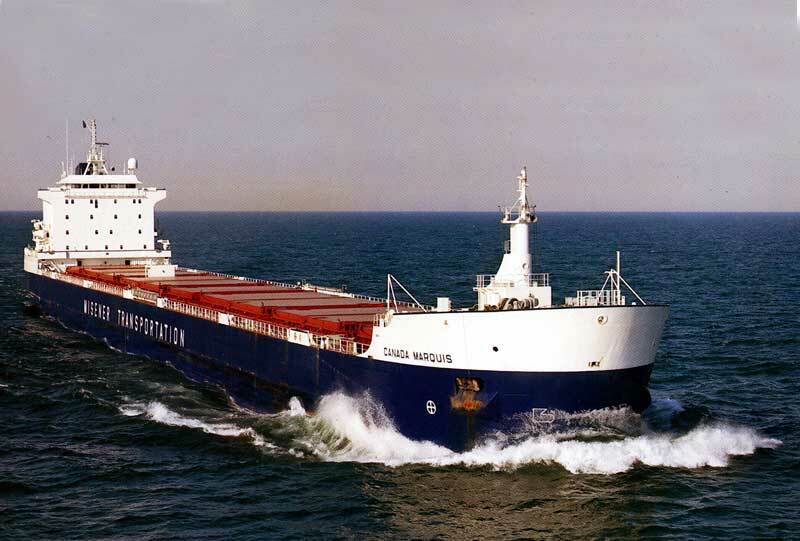 During the Canada Marquis' first winter (1983), the vessel was engaged in moving coal from Sydney, NS to Santos, Brazil; grain from Brazil and Argentina to Bremen, West Germany; and grain from Quebec City to Tilbury, England. November 1984 saw the Canada Marquis load grain for Leningrad, Russia; then continue to work the European grain trade between Hamburg, West Germany and Leningrad. December 1985 saw the vessel load grain at Toledo, OH for Seaforth, England followed by a Russian charter, returning to the Great Lakes with a load of Swedish steel. On September 12, 1988; an unloading crane collapsed onto the Canada Marquis while unloading steel in Chicago, IL holing a tank top and damaging hatch combings. Repairs were completed at Thunder Bay, ON. The vessel was rammed from behind on March 17, 1990 by the saltie British Tay while the Canada Marquis was stopped in heavy ice in the Gulf of St. Lawrence. She was repaired at Lauzon, QC and was registered under the Isle of Man reflecting a change away from her original Canadian registration. Later in 1990, the vessel was again reflagged out of Port Vila, Vanuatu; followed by the transfer in 1991 of the vessel's ownership to Federal Navigation, Detroit, MI (division of FedNav Ltd., Montreal, QC). Ownership then passed to Ubem S.A., Antwerp, Belgium (managed by FedNav Ship Management Ltd., London, England; also a division of FedNav Ltd., Montreal, QC). For 1991, the vessel was renamed Federal Richelieu sailing under the flag of the Bahamas marking the beginning of a new phase in her career; that of an ocean trader. The bulker was renamed Federal MacKenzie in 1992 flying the flag of the Philippines. Ownership and registration of the vessel changed several times over the following years but the bulker retained her name and remained under charter to FedNav. 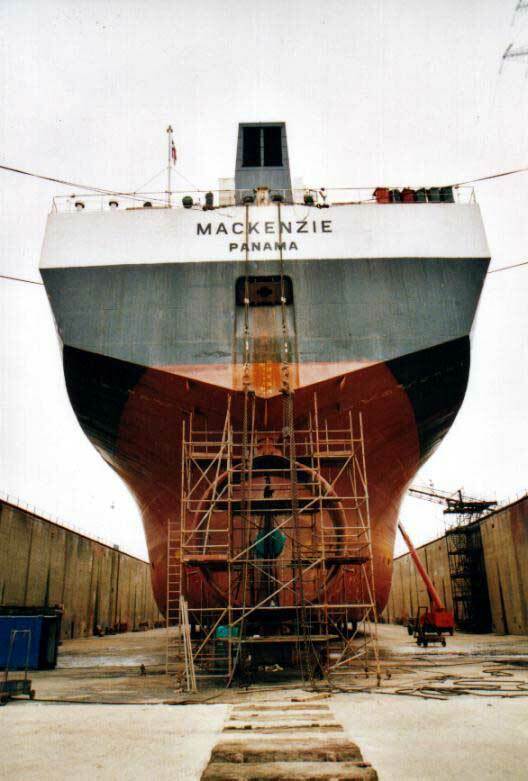 The vessel was renamed MacKenzie in 2001, remaining under charter to FedNav International; owners at this time being M & N Shipping Corp., Tokyo, Japan and registered out of the Panama. Throughout her tenure as an ocean trader, the Federal MacKenzie continued to be a regular visitor to the Great Lakes. 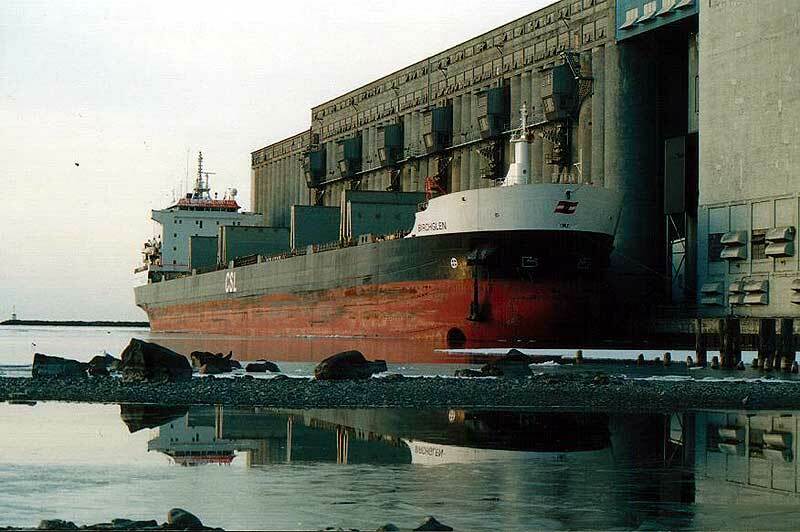 On July 14, 1993; the bulker grounded in the St. Lawrence River on the south side of the Vercheres-Contrecoeur Channel just east of Montreal, QC. A loss of power thus a loss of steering was the cause but there was no damage to the vessel. 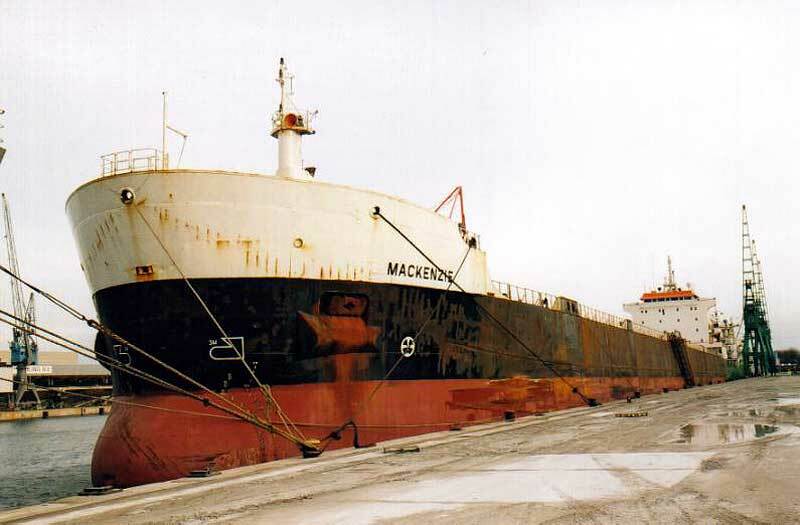 On June 8, 1994; an electronic failure in the bridge control systems caused the Federal MacKenzie to strike the ship arrestor of the St. Lambert Lock in the St. Lawrence Seaway. There was no damage to the vessel but repairs to the lock delayed vessel transits for about 12 hours. 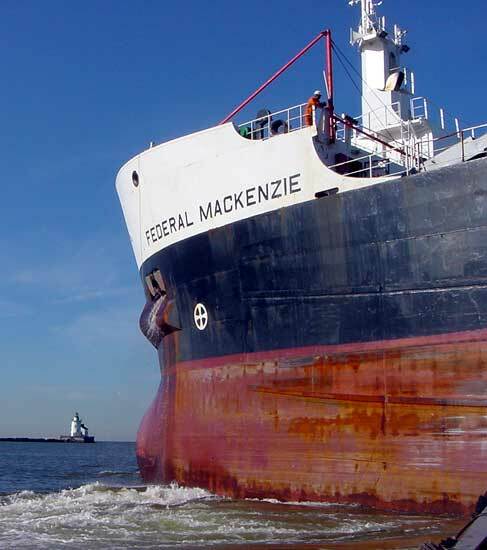 On December 23, 2002; Canada Steamship Lines Inc., Montreal, QC announced the purchase of the MacKenzie from FedNav Ltd., Montreal, QC; who, in turn, had acquired the vessel from M & N Shipping with the expressed purpose of selling the vessel to Canada Steamship Lines. The vessel arrived in Montreal, QC on February 7, 2003 when it was officially registered Canadian out of the port of Montreal and renamed Birchglen (2). The Birchglen's hull color remains black (with "CSL" in large white letters on either side) in keeping with CSL's color scheme of black hulls for the bulkers and red for the self unloaders. The naming of the Birchglen follows CSL's naming pattern for its bulker fleet. The 'tree' motif reflects back on the 1937 CSL acquisition of Tree Line Navigation Co. and the 'glen' suffix from the 1926 acquisition of Great Lakes Shipping Co. whose vessels included names such as Gleneagles and Glenelg. The Birchglen's maiden voyage for CSL was in ballast from Montreal passing upbound through the Soo locks on April 5 2003 and battling ice in Whitefish Bay with a convoy of other vessels including her sister ship and fleet mate Spruceglen with the able assistance of the USCG cutter Mackinaw. 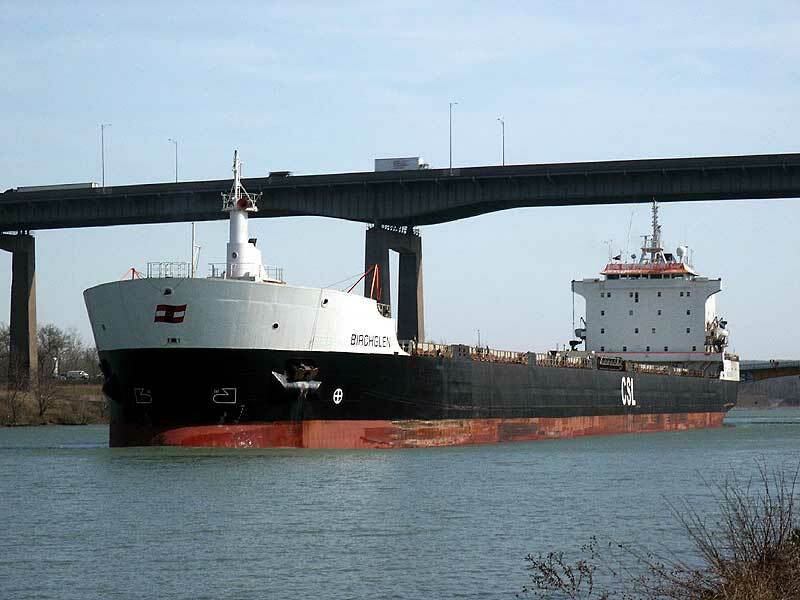 After loading at a Lake Superior port, the Birchglen was downbound in the Welland Canal April 12, 2003. 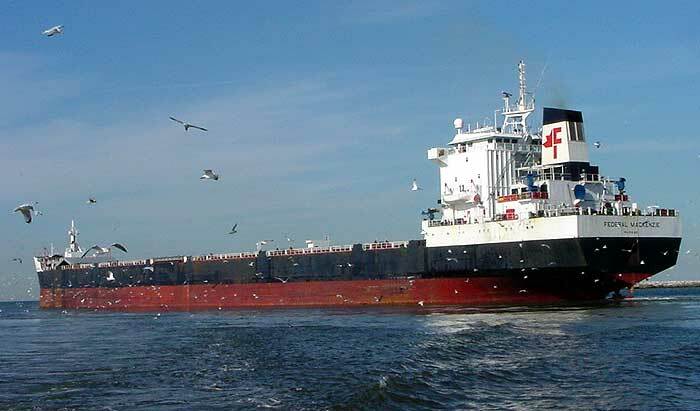 With plans to use the bulker for year round ocean trading, Canada Steamship Lines had the Birchglen was reflagged out of Bridgeport, Barbados in April of 2004; her Canadian registry being closed April 8, 2004. The bulker however, continues to regularly call on the Great Lakes and the St. Lawrence Seaway. She returned to Canadian registry on March 30, 2006 returning to predominately Great Lakes trading during the navigation season riverting to ocean trading during the winter months. On Sept. 25, 2015, the vessel departed her Montreal lay-up berth under her own power bound for the boneyard at Aliaga, Turkey. She arrived there on Oct. 14, was driven up on the beach on Oct. 22, and was soon cut up. Of note, the first Birchglen was launched October 7, 1926 as the William McLauchlan for Interlake Steamship Co. The 600' (loa) vessel was renamed Samuel Mather (5) in 1966; then Joan M. McCullough in 1975 after being sold Canadian. She was renamed Birchglen on September 16th, 1982 after being acquired by Parrish & Heimbecker Ltd. (P & H Shipping Ltd.) of Mississauga, ON. 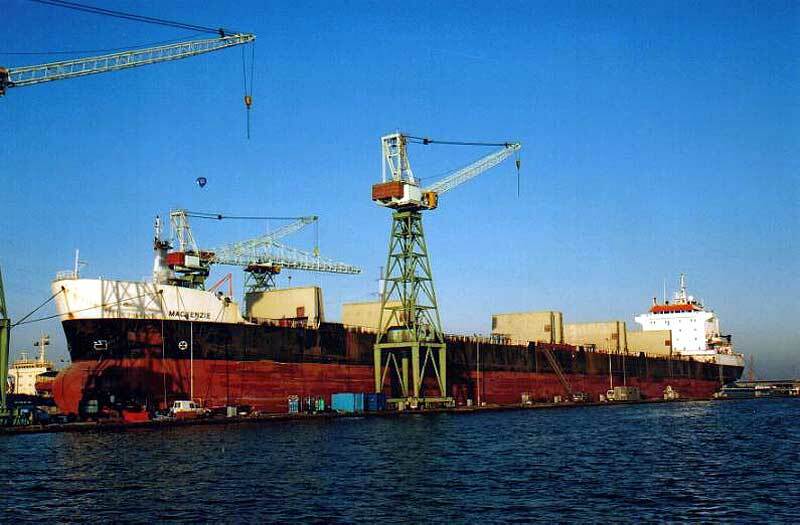 After being used as a storage barge in Toronto during the winter of 1987/88, the vessel was sold for scrap and towed off the Great Lakes on April 21, 1988. The first Birchglen loads at the elevator in Sarnia on Aug. 19, 1985. In Cleveland Harbor, Nov. 1, 2000. 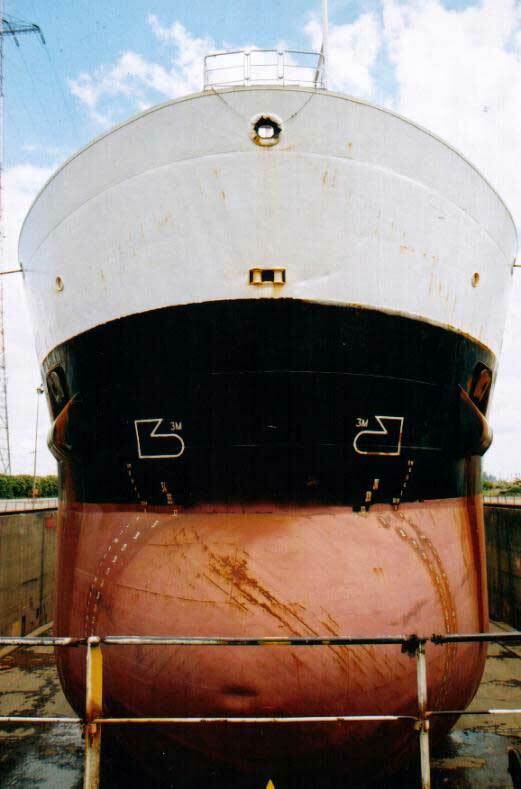 In the drydock for repairs in Antwerp, Belgium, June 23, 2002. Close up of propeller and cort nozzle. Antwerp, Belgium on Jan. 4, 2003. Shipyard, Antwerp, Belgium on Jan. 11, 2003. Close up of name, March 31, 2003. Upbound at the Soo, Apr. 5, 2003. Upbound the Welland Canal at Port Weller, Oct. 2005. At Goderich, June 17, 2006. St. Lawrence Seaway, July 26, 2006. Detroit River, Aug. 5, 2006. Unloading at Marinette, Sept. 19, 2006. Clearing Welland Canal's Lock 2, Oct. 9, 2006. Arriving at Hamilton, July 8, 2007. Downbound off Lake Huron, Oct. 14, 2007. Loading at the elevator in Sarnia, Oct. 14, 2009. Emerging from the Novadock, Halifax sporting her new red paint job, March 20, 2010. St. Lawrence Seaway approaching the Iroquois Lock, March 30, 2010. Upbound Welland Canal, March 31, 2010. Welland Canal, Apr. 10, 2010. Loaded with Windmill parts, Aug. 2, 2010.